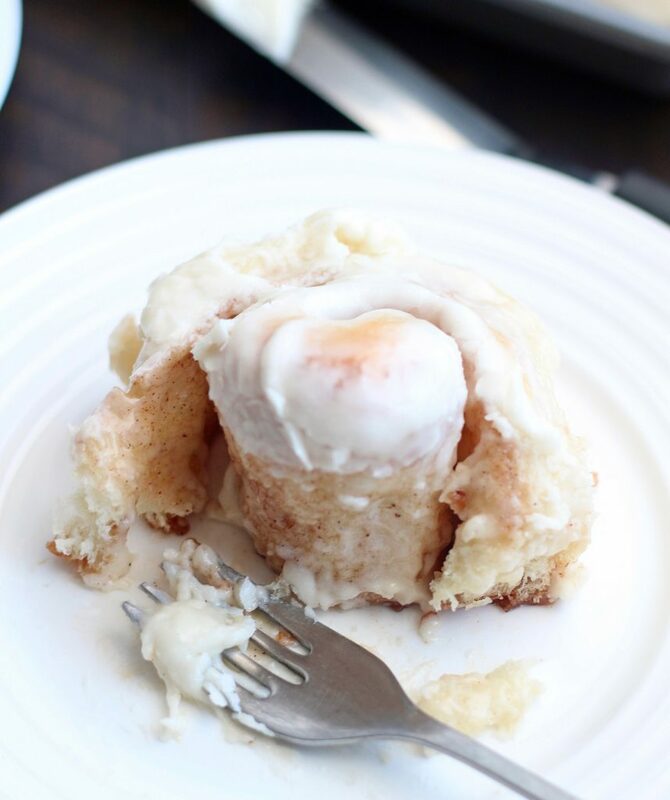 French Bread Cinnamon Rolls may just be our new most favorite cinnamon roll in the history of ever! 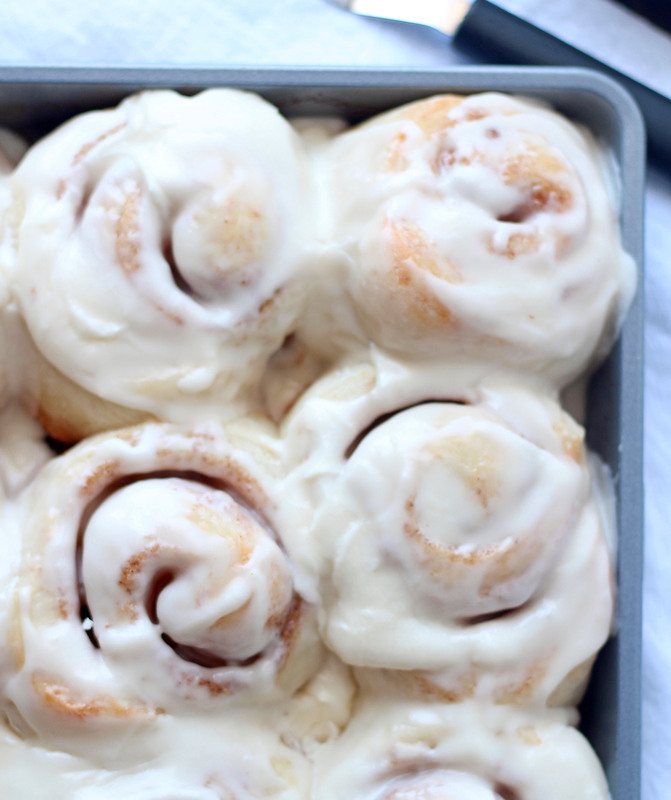 Tender, light, and slightly chewy, these cinnamon rolls will completely win you over. I did a bad thing the other day. Not just regular cinnamon rolls, but French Bread Cinnamon Rolls and they are to die for! Because I have no self-control when it comes to cinnamon rolls and I ate more than I care to mention, I really should go run about 12 miles. Problem is, I can’t run because I slipped and fell on some icy cement steps the other night and I’m slightly banged up and really sore. . . .I shouldn’t have made the dang sweet rolls. Ugh! I made my french bread the other night for a second time this week and decided that instead of making the two loaves of bread the recipe makes, I would use half the dough to make cinnamon rolls. My kids are praising/loving/thanking me. Taylor and Zach both declared these THE BEST cinnamon rolls they’ve ever eaten. I might possibly have to agree. These are tender and light with just a little bit of chewiness to the dough. 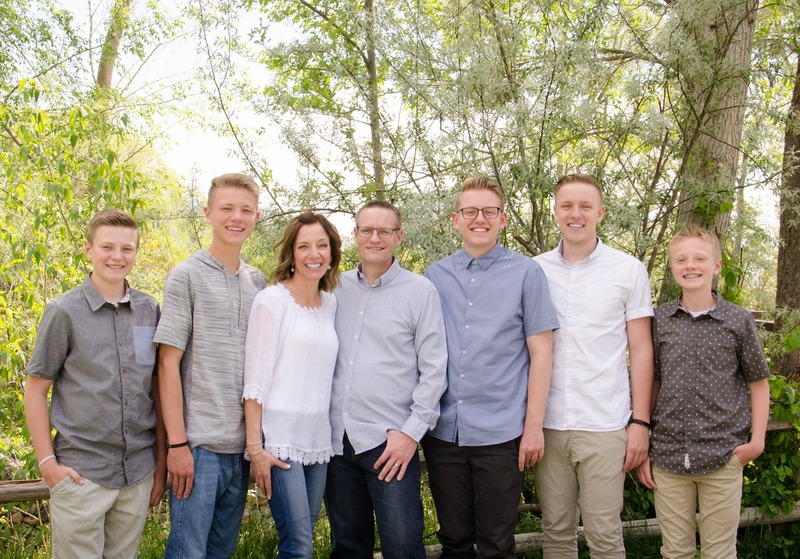 They’re absolutely phenomenal! I have always been loyal to my grandma’s sweet roll dough that I grew up with. Whether we had them with cinnamon sugar filling or her almond filling, it’s always been my favorite. Buuuut these french bread cinnamon rolls may have just completely stolen my heart. I guess I’ll have to make another batch of dough and use the almond filling, then I’ll know for sure . Some of my boys placed dibs on what was left of these for breakfast, we’ll see who gets to them first. . . . me or them. This recipe can easily be halved if you only want to make about 12 rolls. You could certainly do what I did and make half of the dough into cinnamon rolls and the other half into a loaf of french bread. You can click the link in my post for directions on how to roll and bake the bread. A packet of yeast has 2 1/4 teaspoons in it, so you'll need 5 1/2 teaspoons of yeast if you're making a full batch. I'm really bad about measuring when I make buttercream frosting, I just kind of dump the ingredients in the bowl. 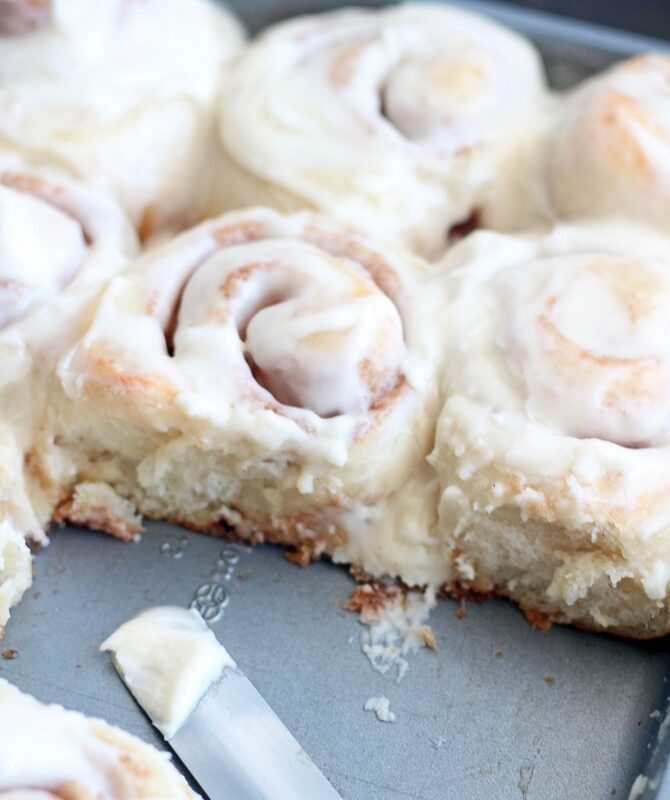 You can certainly make your favorite recipe and use for these cinnamon rolls. Dissolve yeast in ½ cup warm water. Let stand 10 minutes. In a large bowl or the bowl of a stand mixer fitted with the dough hook, combine the 2 cups hot water, sugar, salt, oil and half of the flour; beat well. Stir in the dissolved yeast and the remaining flour. Mix well. The dough should clean off the sides of the bowl and not be too sticky but it should still be soft. Turn the dough onto a floured board and knead once or twice until lightly coated with floured. Divide dough in half. Roll each part into a rectangle (about 10x15). Combine both sugars and cinnamon in a medium bowl, mix until combined. Divide the butter between the two rectangles and spread evenly. Divide the cinnamon sugar mixture between the two halves and sprinkle on top of the butter. Roll up jelly roll style and pinch seams to seal edges.. Cut each rectangle into 10-12 pieces. Place cinnamon rolls in either two 9x13-inch pans that have been sprayed lightly, or place on a prepared cookie sheet. Cover and let raise until double in size (about 45 mins). Bake at 400 degrees for 14-17 minutes or until edges begin to turn light golden brown. Allow to cool for about 5 minutes before frosting. To make buttercream, beat butter until smooth, add powdered sugar, vanilla and salt and half-n-half. Mix until smooth and well combined. Spread over warm cinnamon rolls. This is brilliant! I am definitely going to try this the next time I make bread. Honestly, the best cinnamon rolls ever!